Need Curb Appeal and Still Curb Cost? Miller Garages also offers vehicular stackers. 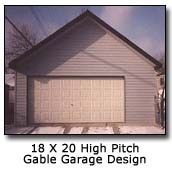 This piece of equipment will allow you to maximize your garage space by stacking your vehicles. It is great for the car enthusiast who has found difficulty in the past with storing their collection to prevent wear and tear on the body of the automobile. Stackers are convenient.